Not so much this time, just the image and the sketch leading up to it. I made this sketch using sketchbook pro, without the pro license. Somehow it’s rather difficult for me to make tight lines. I thought her legs where somewhat weird so I changed them. Also made them shorter in general. 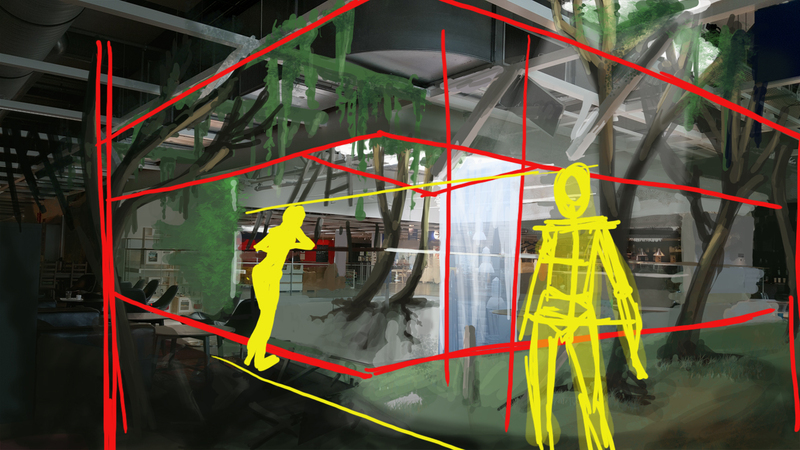 The frame was again used to give some dynamics…also to give some perspective. I can’t say so much about the characters yet, because I’m still developing them. He’s quiet, she’s…well easily provoced. She doesn’t avoid fights. Here you see a couple designs I made for the house of S8i’s parents. It’s a rather big building. Hand-made by her father, an engineer and a bit of a tec-geek. Down here is a page out of my sketchbook. I used to carry that book with me all the time. Most of the sketches I made on vacation with my wife. Vacation is a wonderful way of coming up with stories. Especially adventures; you meet interesting people, see different parts of the world and sometimes you start to think in a totally new way. On this page you see my first attempts at giving S8i a back story. That means thinking about the parents and the place she grew up in. Developing her free mentality. I started this out by drawing the bathtub. We really want to have a bathtub in the house, so one day I started looking for a good one on internet. I found an ancient tub on an archeological website. Apparently the Inca’s used to have elaborate water systems including bathing areas. After the first attempts at the house it was time to think about everything the building should contain. It’s not to scale. Please keep in mind I’m not trying to create some kind of dreamhouse. Just a place where the protagonist grew up. 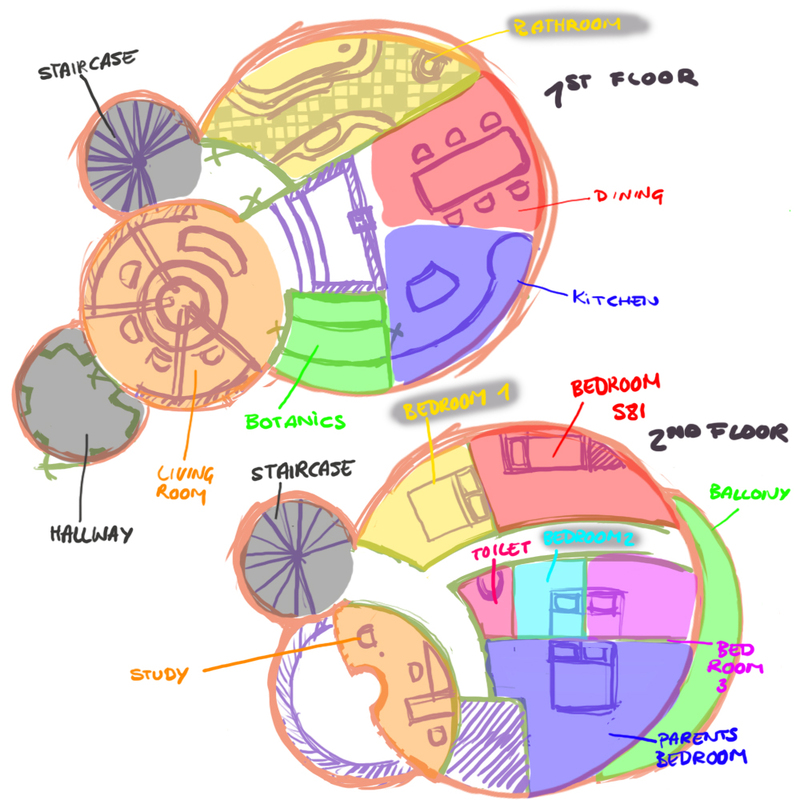 So, in this picture you could see there are a lot of rooms. Not just for the parents, and S8i. But for at least four guests at a time. My idea was: give S8i a childhood where she came into contact with lots of different people. This would make her interested in stories of far away places, and give her the capability to judge people correctly. My first color render of the house. Nothing too fancy. Just a way to get a feel for the colors. 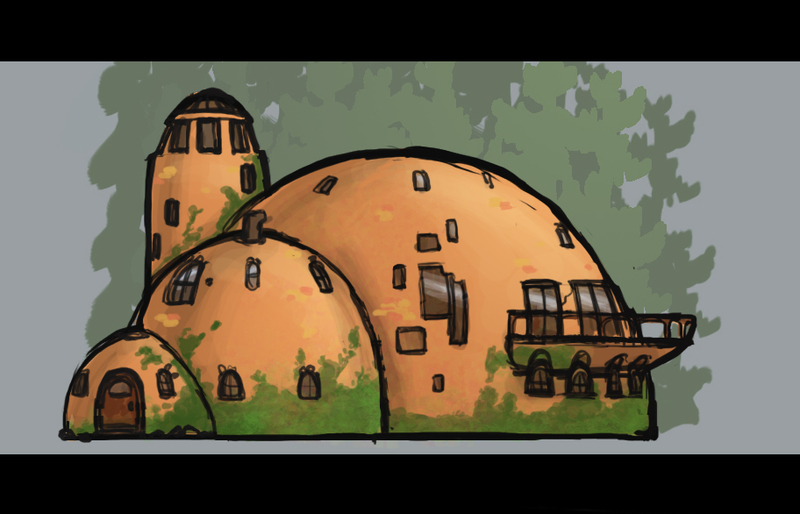 I want to make the backgrounds in a mix of 2d and 3d, a bit like some of the Ghibli movies….Yeah big fan here. I did some tests using Blender. But still have a lot to learn. The house itself is situated somewhere in the forest. I’m thinking a bit like the black forests in Germany (Hah! I feel another camping trip coming). And as last a render I made using my own texture maps. Still looks too smooth. It’s not 2d enough. But it’s a start, and I really liked the lightdynamics. In case you’re wondering I used cycles render, not the standard Blender one. I decided to train my drawing skillz, so from now on I will upload a new sketch at least once a week. Next to the sketch I’ll try to publish 2 underlying layers. I hope they are interesting enough. In this one I tried to have a bit more fun with the frame, and not just have it as a backdrop. I really like comics in which the artist plays with the medium. On one side you have Herge’s Tintin; the frames are consistent throughout the entire comic..no comicseries. And on the other side of the spectrum you could find someone like Hanco Kolk. A dutch artist who constantly experiments with his style and the framing. 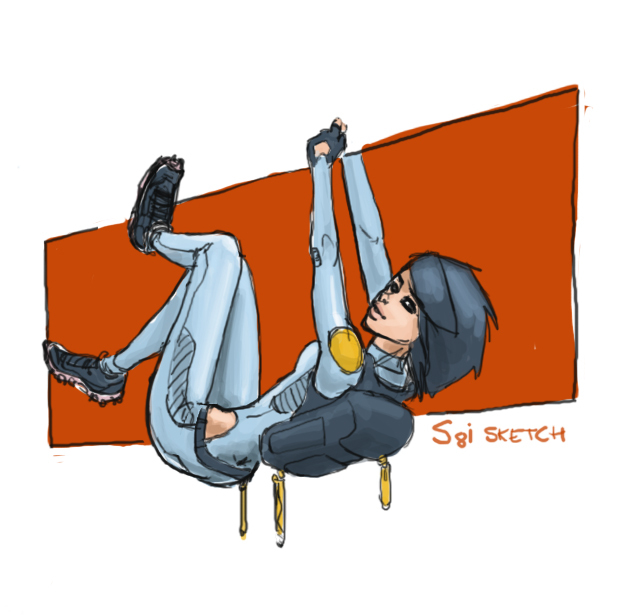 Above was my first sketch of S8i hanging/climbing on something. I didn’t really have a back story for this one. 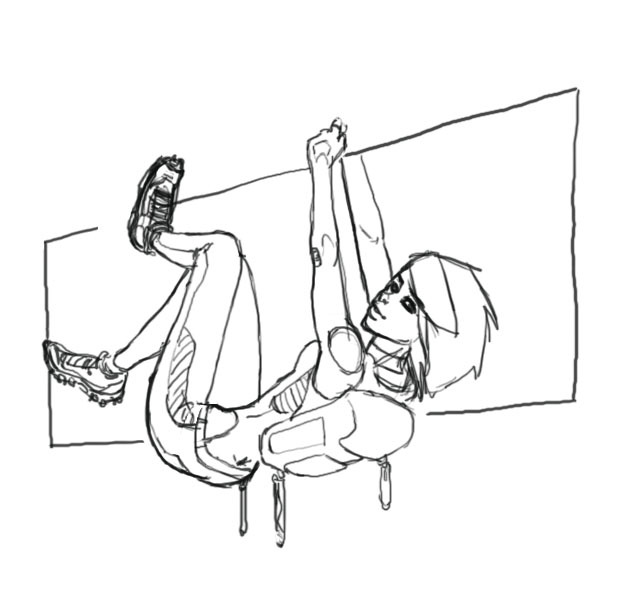 Just wanted to draw her climbing. Climbing positions have a whole set of difficulties. I have to draw the face from a weird angle, and use a little bit of forced perspective. When I started to put down the lines I noticed in the sketch she seems to have very small hips. So I had to rotate the leg closed to the viewer in order to change that. 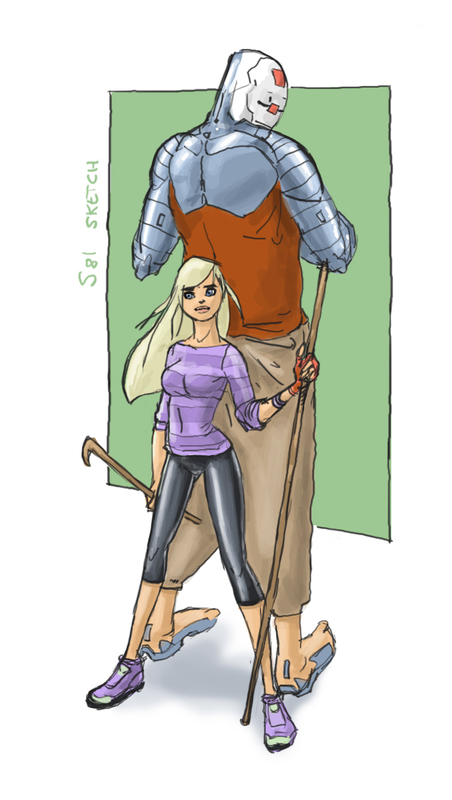 And there is the colored version. OK, I hope you understand I’m not a master animator, or even a professional one. This is just a hobby. I try to get better every time. So most of my posts will consist of my practice work. Reference material is a must, so every week I’ll put some pictures online. Next to these pictures I’ll upload some sketches. It’s really cool to design a post apocalyptic world, this new world is not necessarily an evil or bad world. It’s just different. There are hints to the one we are used to live in, but the occupants are more or less oblivious to the previous societies. 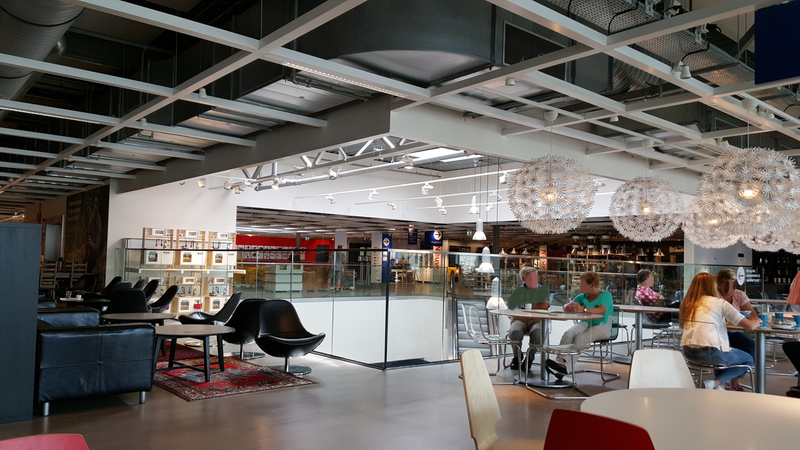 Above is a picture of a standard IKEA. I wanted to see what this store would look like after several hundreds years of ‘botanic abuse’. So in my first altered version I just added some sketched plants. As seen below. In my last sketch I put some extra lines. So to make it easier for me to see the building in reference to the characters. 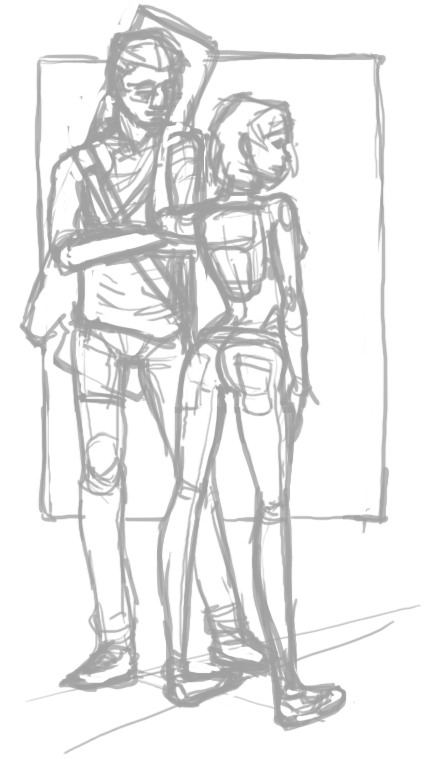 In the end I will probably not have a mix of real live photography and sketches. 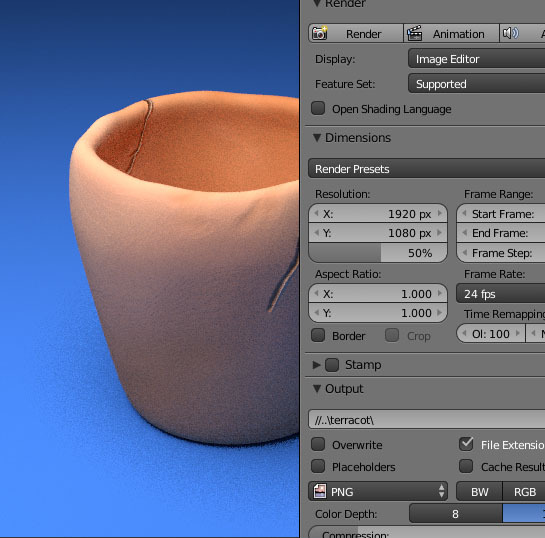 But make a blender3D/GIMP 2D drawn background blend. above a couple of sketches. Nothing to post yet. I Have a lot of ideas, but these have to develop over time. 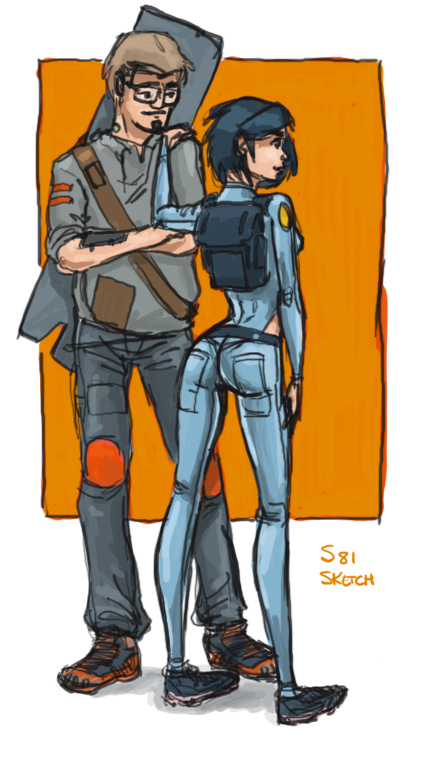 I’ll try to put my newest sketches, colorschemes, background designs and storybeats. After a while I hope to to upload some fully animated sequences. But give me time. At the moment this is just an outlet for my hobby: animation and design. In no way do I think this will ever be developed into a fully animated series. It’s more an excercies and a forum to put my work. Do you want to see my spaceship? 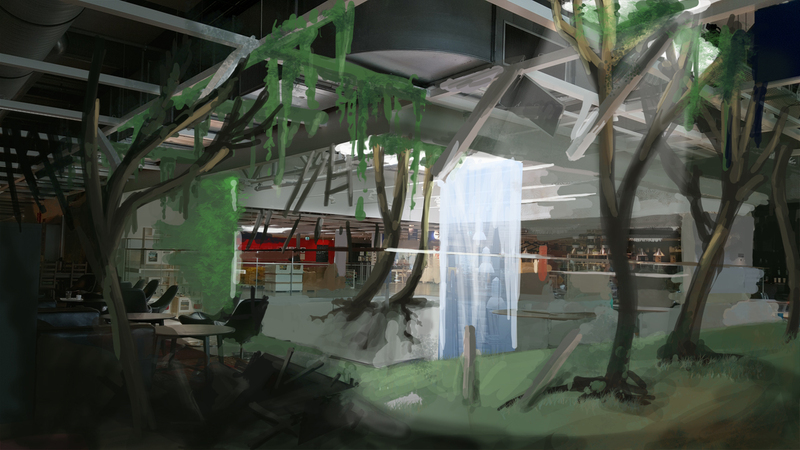 For matte paintings, setdesign and concept art. Home is where the Geeks are! Backing away from the daily sketching of 2015, to observe more slowly and acutely.